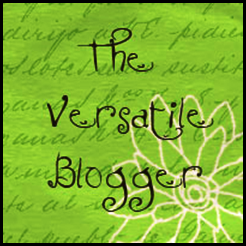 Yeah I have recently been given 'The Versatile Blogger Award' by two of my lovely followers. The first was from Patricia over at lemondropsdreamtoo and then again from Nishana from princessliya I have had a few awards lately so I am happy that I am being noticed out there in blogworld! 2) I love to walk about the house in bare feet - which really annoys my husband! 3) My favourite ice-cream is simple Vanilla. 5) I am currently on a diet/exercise regime. 7) I crave to drink a nice cold 'Diet Coke' but I suffer from IBS which flares up if I drink any fizzy pop! I hope these bloggers enjoy their awards and hopefully pass it onto some other bloggers. Congratulations Karima! And a deserved winner you are. Thank you so much for nominating me. That's really nice of you. Congratulations on your award and thank you so much for passing it onto me! I'm so pleased! Enjoyed reading about you and looking through your blog - great pajama pant tutorial! Congratulations Karima and thank you so much - will post soon.